The narrows project on 414 is finally done. 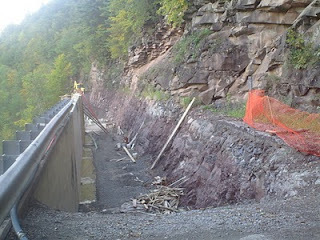 They opened the road yesterday only six weeks past the time they had estimated. I had guessed Dec 1st back in October so I was a bit closer. 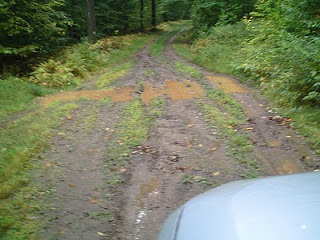 It is a far cry from the half falling off road we are used to. 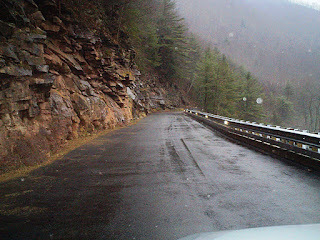 I did notice it makes other parts of the road coming up to this one look much worse. Since it took 20 years for them to really fix this part I am not holding my breathe on anything else getting done. It got to 51 degrees today in the middle of December. 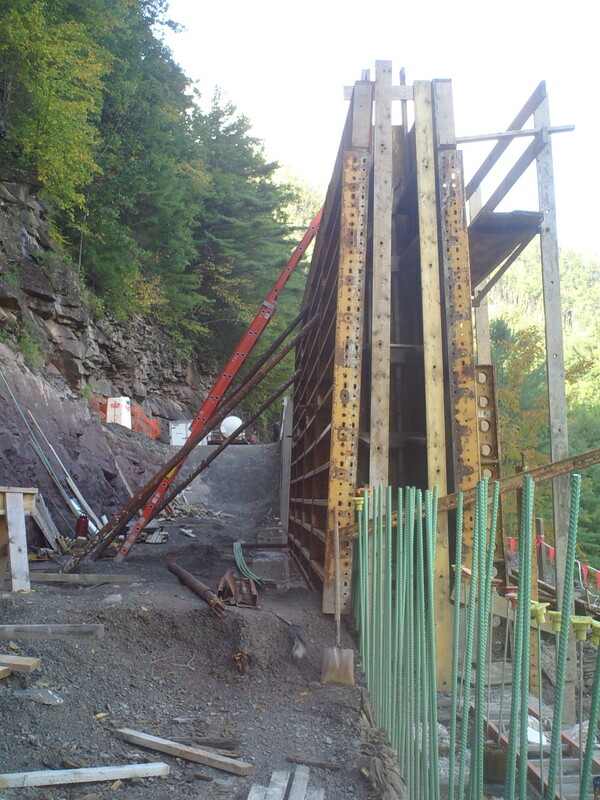 I am not complaining as I am still working on the job at Slate Run, which is only 13 miles from me when the road is open. But once the snow closes the road it will be over 50 miles to go around. Things are quiet up here as they get once the hunters and tourists go. 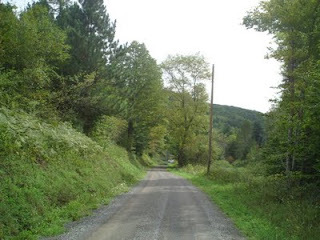 It is easy to get used to the quiet and not want to be around anyone even in a small city like Wellsboro. But with Lee being gone for over five weeks, I will admit I am looking forward to someone to talk to again. She is coming home this weekend, and I have already been warned that she is not up to working on the first day back. I guess watching a two-year old for 5 weeks tends to wear you out a bit. So Saturday I have to make the house look like I haven't been living in it alone for five weeks. That will be an all day job...plus the dogs have to all be bathed. No one will escape the cleanup. Lost power this morning for a few hours a tree decided to fall randomly. When trees fall in the woods and you don't hear them; they still knock out the power. I got the grand kids presents sent, which other than some things I made for Lee is all I am doing this year. It is funny how once you get older the things you want either so small you get them along the way or so big you can't afford them. Course the one thing I wanted the most is Lee to be home for Christmas and it looks like I am getting my wish. After all the holidays are about sharing time with your family, friends and the ones you love. Mountain girl, Paula, logging out. Saturday, Donald Robblee, walked up to my camp with a big smile on his face. He told me he had just shot a large buck up Misner Trail behind Hook's Cabin and drug it down to their place. The problem was his truck was on the other side of the mountain. So I drove around and picked up his truck and helped him put this buck in the back. It was all we could do for both of us to lift it. He estimated in weighed about 140lbs and figured it to be pretty old as it ears had been torn up from past fights and its eyes didn't seem good. The interesting part is the deer only had 5 points three on one side and two on the other, but the spread was over 17.5". So this deer proved that points don't necessary predict age or size. I got a free dinner out for picking up his truck and with Lee Anne still gone helping her sister it was nice having food that wasn't out of a can or a box. 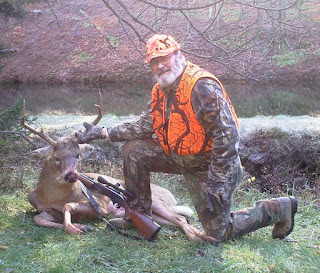 Robblee also shot a coyote while deer hunting. Seems to be quite a few of them out as well. Didn't see too many others with deer so far but thought you would enjoy this. 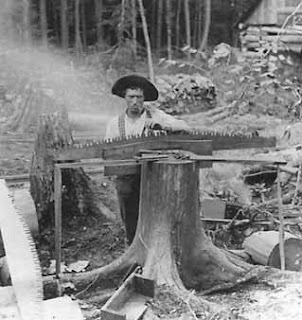 This logger in Leetonia is sharpening his saw to get ready to kill the Thanksgiving day turkey. We have big turkeys in Leetonia so only the largest of saws will work. The biggest problem with our turkeys is they won't fit in a stove so you have to cut them into pieces and spread them around or start a big bonfire to cook it whole. 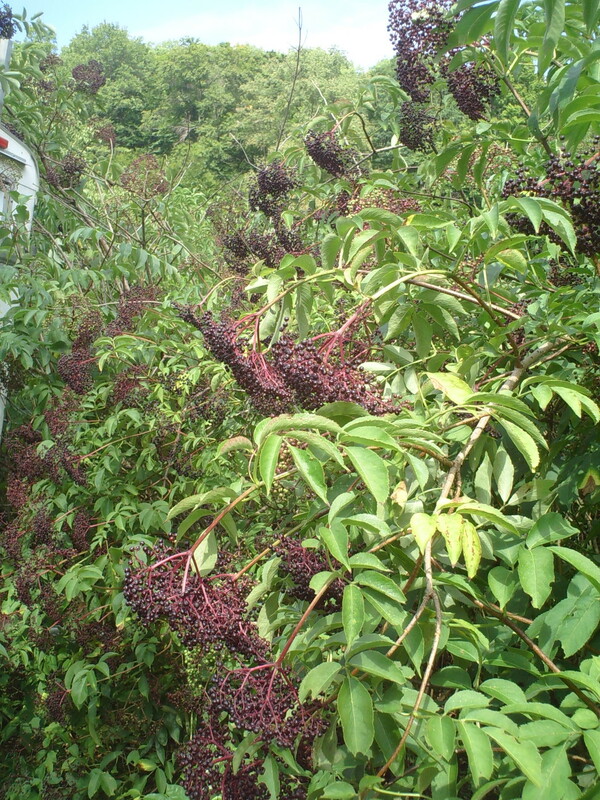 Don't you wish you lived in Leetonia? Have a great Thanksgiving wherever you live. Mountain girl, Paula, getting ready for one big turkey. The weather has been unseasonably warm and bear season is in full swing. Lots of hunters in the woods, but I haven't seen a dead bear yet. Just finished roughing in a small addition close to Slate Run. The owners are coming up for hunting season and my brother is coming up for Thanksgiving, so this is the last day I will be working for a week. Wow, can't think of the last time I had a week off. Of course that means I get to do work around the house that I have been ignoring and cook for my brother and his girlfriend. My brother is bringing his dog up with him, so that will be four dogs in the small place. Hopefully, none of my dogs will eat his dog for Thanksgiving. They aren't always too accepting of a new face right away. Lee is still gone to Rockford, Illinois to help her sister with taking care of a 2 year-old, while her sister watches over her son in intensive care up in Madison, Wisconsin. Her son, Neal, 19, has leukemia, which has reoccurred at they are all on needles and pins. It is tough seeing a young person be so sick. So say an extra prayer for them this Thanksgiving. After Thanksgiving is deer season so the boys will be up to chase the deer and the beer. Hope you all have a great Thanksgiving and spend time with the ones you love. I will be missing my dad this year for the first time and I know many of you have loved ones not at the table...so cherish the ones you have while they are here. Even if some of them are pains in the b..., Mountain girl, logging out, and cleaning house. Well, Tuesday, was election day and I finished the outside painting of School house buildings (outhouse included) just in time. 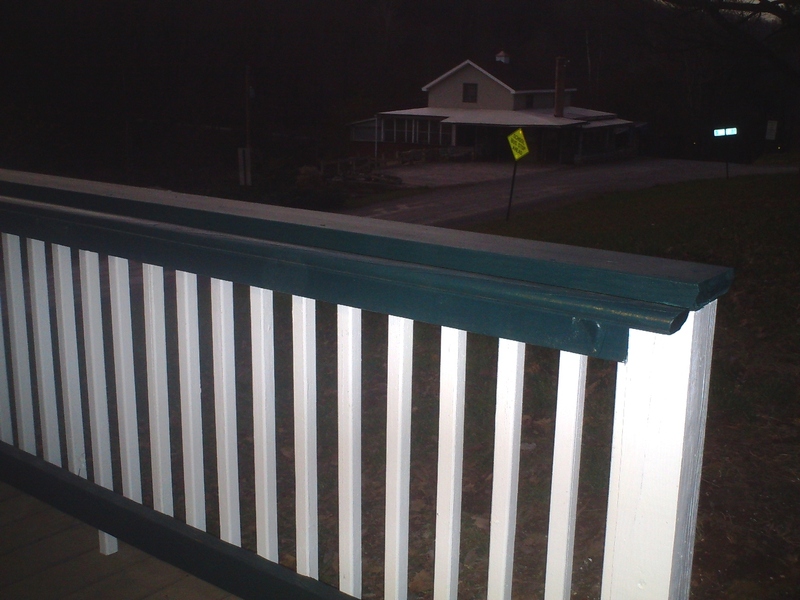 I added a little color to the porch by painting the top and bottom rail dark green and the spindles white. The door is also green to match. It made a huge difference over the green-treated wood look. I took these pictures as the sun was setting so they are a bit dark. The sun is setting earlier thanks to the time change. We can now count on it being dark by 5:30 pm. We have had absolutely beautiful weather for nearly a week. No rain and temperatures way above normal in 60's and 70 one day. I have to say it spoiled me a bit. I know when it goes back to normal temperatures for November I will be complaining. All the "girls" plus Bill Merkle manned the ballot machines from 7am to 8pm. 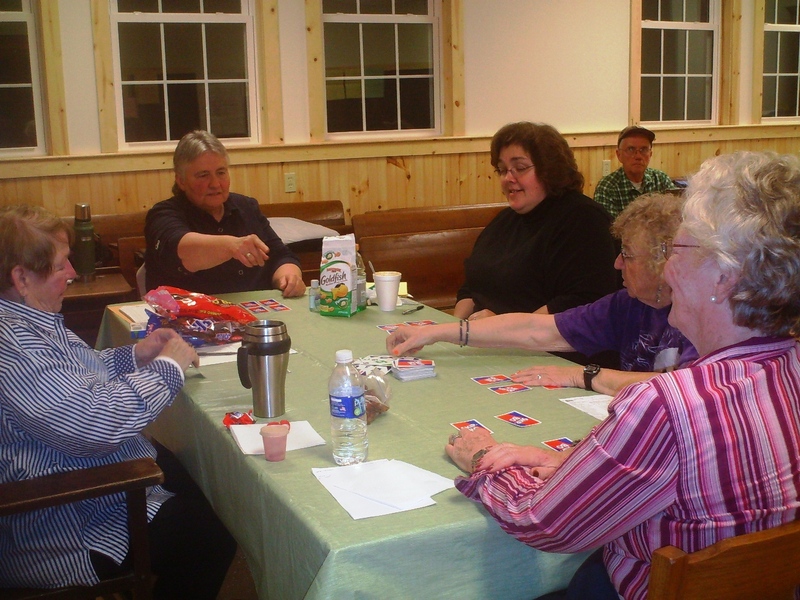 With only 32 voters registered in the township, it makes for a lot of free time. Time they use up by snacking and playing a township version of Skip Bo that I can't quite get used to. ended up with somewhere around 26 voters by the end of the day. Well all that is left to do in the school house is a few more repairs on furniture, which I will do as I have time between jobs. One day soon I hope to set up all the school desks and get a nice picture of the building as it might of looked when school was in session. Mountain girl, Paula, logging off. P.S. Thanks to all who stop when they see me and say hi. Makes me realize how many people read and enjoy this little part of heaven in Elk Township. Well over the weekend Melvins place got hit by vandals and thieves. 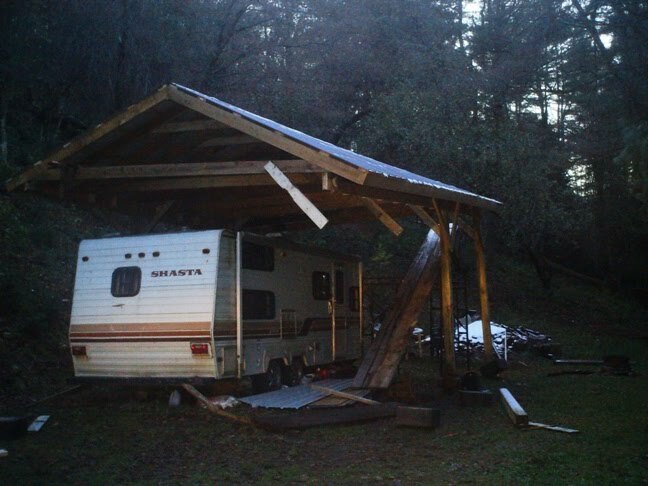 They stole some scaffolding and pulled the posts down holding a roof over his camper. 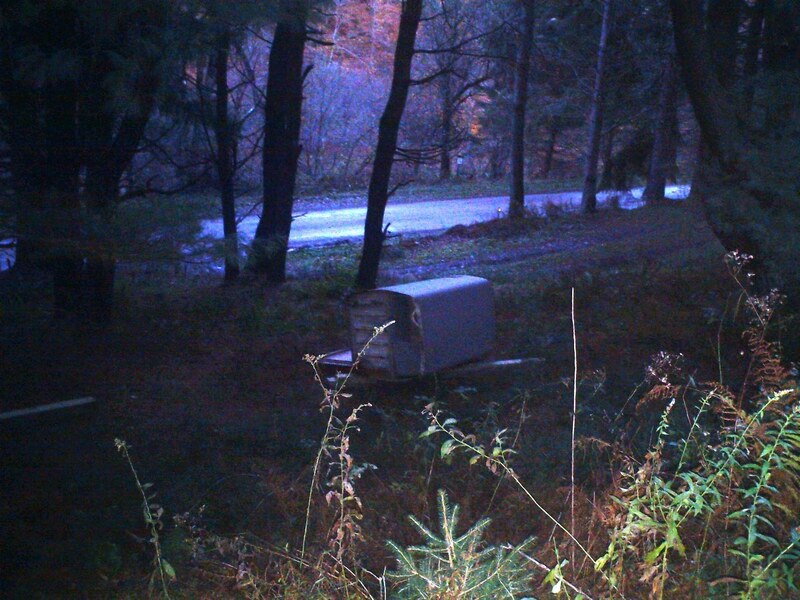 They also pushed his outhouse down the hill. This kind of behavior is inexcusable no matter how you feel about someone you don't do this kind of damage. This isn't the first time Melvin's place has had damage, but it has been a long time since the last incident. Anyone with any information about the person or person's involved in this should call the State Police. 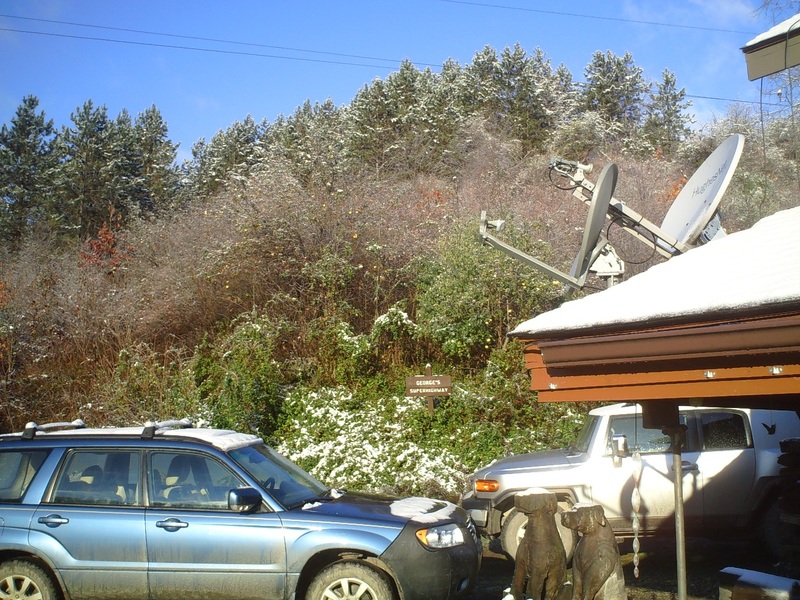 Crispy start to the morning at 25 degrees, but very little snow. We are just North of the line of heavy snow that hit others and I am not at all upset about that. Our temps will go above freezing today and I am guessing the small amount of snow we have will go with it. Since I am digging a footing tomorrow for a frost wall I am perfectly happy to see we are looking at decent temperatures and a little drier weather for next week. 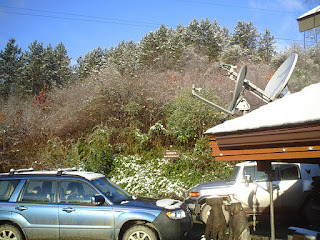 It is always a push to get the last few things done before "real winter" hits and the ground is frozen hard. So for anyone worried about their camp, never fear, the woods are clear. Mountain girl, Paula, logging off. My mother will scream when she sees this post, she is afraid of heights. However, mom notice I do have my safety harness on! For the rest of you we finished painting the outside of Maynard School and by the looks of the weather just in time. The last part to be painted was the bell tower. I had hoped to get a picture of the bell, but without removing wood panels it was impossible to see much of the bell. On the very top of the bell tower was a wood pillar. I am sure something was on top of it at sometime. I am guessing either a weather vane or lightening rod, the first seeming the most likely. Our power went off in the middle of the night and I had to get up before it got light of course lately that just means before 7am. I had a kerosine lite bowl of oatmeal to start the day. 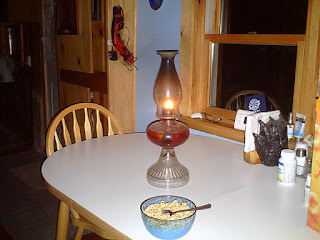 Fortunately the power out was solved by 7:30am so Lee didn't have to deal without power all day. 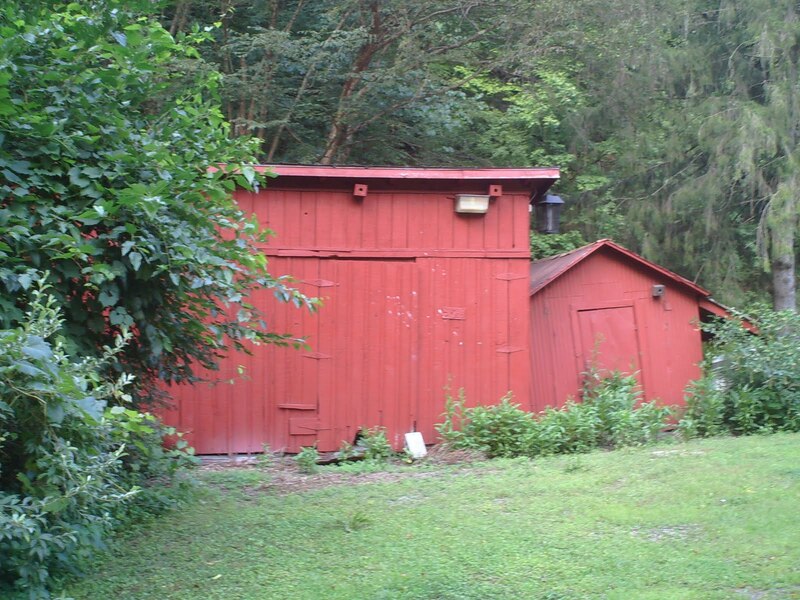 It appears the problem was somewhere in the Cedar Run area. We are under a winter storm warning for tomorrow. Estimates ranging from 1" to 10" are floating around. In looking at the weather map it appears we may be on the edge. So I am hoping for the closer to 1" amount. I still have a foundation and small addition to get up and under cover before the big stuff comes. I will let you know if we get anything of significance tomorrow. Mountain girl, Paula, logging off. Snaggle Nose was first injured in June of 2009. None of us thought he would make it past the first hunting season and yet here he is over two years later. Dutch one of the township road workers took this picture during this summer of the bear right in our front yard. Snaggle Nose was in pursuit of a female bear at the time and didn't seem to care that the men watched him. Somehow he must be able to smell in order to track a female and keep from being shot. Unlike humans who might feel a bit intimidated if half their face was torn off old Snaggle Nose still makes other smaller bears flee in fright at the sight of him. And appears to be quite the lady's man. 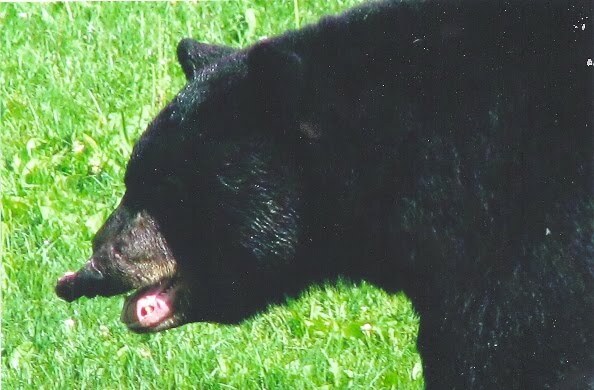 I often wondered what the other bear looked like that Snaggle Nose tangled with. He is truly one amazing animal to have not only survived but prospered after an incredibly hard fight. Mountain girl, Paula, logging out. First picture is fireplace(creates atmosphere), second picture wood burning stove(creates heat), third picture wood shed, and last picture Cedar Crest. Ken, Arlon, Butch and Low put in side windows was raining all day, had crab cakes, fried potatoes, pepper cabbage. Showered went to Frank Bering camp to sleep. 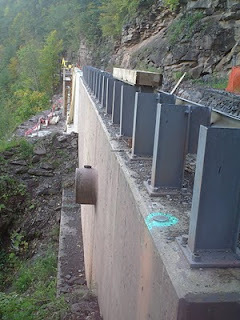 July 5th All 6 guys started cementing between logs got side towards Cedar Run finished about 7:30. Ate supper took our baths at Lee Pines. We pitched horsehoes and went to bed darn tired. 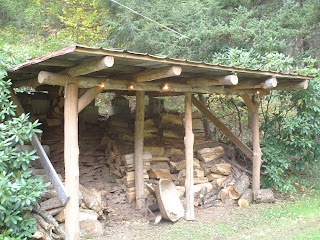 By the end of July all the chinking(cement between logs was done). 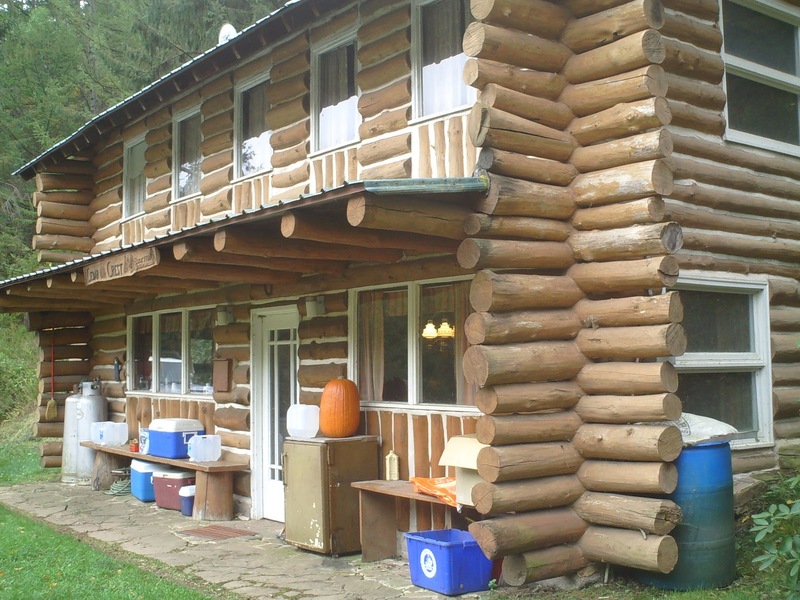 In August they concentrated on finishing work inside cabin. Slate floors were done. Bunk beds assembled. 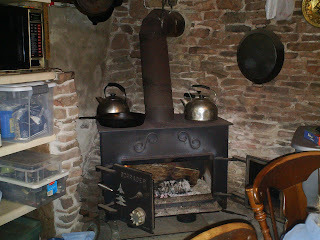 Appliances installed and the wood stove installed. On Labor day weekend the first shower was taken inside the camp. They declared the camp complete on Sept 8th and got back to doing what they have always done at camp, fishing, hunting, and telling stories. Hopefully, in the future I will get some of the in process pictures. But this is truly a story of taking a bad circumstance and turning it around into a special memory to share with generations to come of the summer Cedar Crest came back from the ashes. Mountain girl, Paula, logging out. As typical with weather in the Spring here in Leetonia, Cedar Crest had the on and off again battle with rain hindering progress. I decided to compress the work during the month of April as much was repetitive. April 7th-April 29th. Chimney work started. A lot of rock moving, rain and it appears a few people not feeling too well. Most of this time spent getting walls up and preparing logs for floor joists. 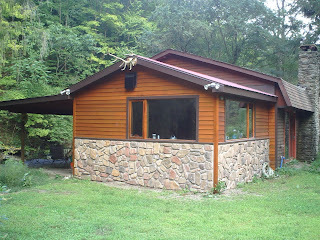 Stone work continues on stairway and back side of cabin. During the month the floor joists are put on and the decking finished. The cabin second floor is framed up and logs put between sections. 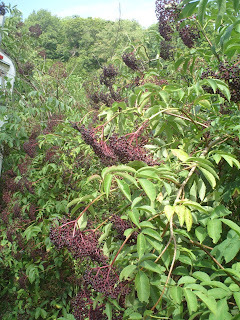 By the end of May they are now battle with black flies and humidity. Ron, BJ & Bob Got in about 1:00am Arlon and Josh in after 3am up at 8 am. 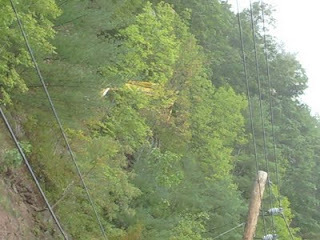 *My understanding is that the pine tree that held the boom became part of the ridge pole for the building. Cedar Crest gets a roof. Guys rallied and worked hard getting ¾ of roof on cabin looks real good. Filled in logs in the top front and back. 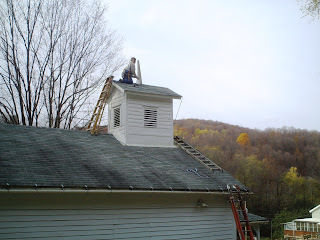 June 17th, 1991 finished all the roof today also did the floor up stairs and started the front porch roof. Finished porch roof with boards. Will put roll roofing on at end of week. Put log strips over 2x4 plates. Started filling in behind old chimney and started putting up new chimney. Sanded some on aspenite floor. Dug up pump and took it to Germania to be checked. Put in 2 more stair steps(Their stairs are all stone so each step took a quite a bit of time). The rest of June they got the chimney fixed, the pump working, put in a shower, finished railing on stairs. By the end of June things were definitely getting tightened up and weather-proofed. All things considered they did a great job getting this work done only on weekends. Mountain girl, Paula, logging out. 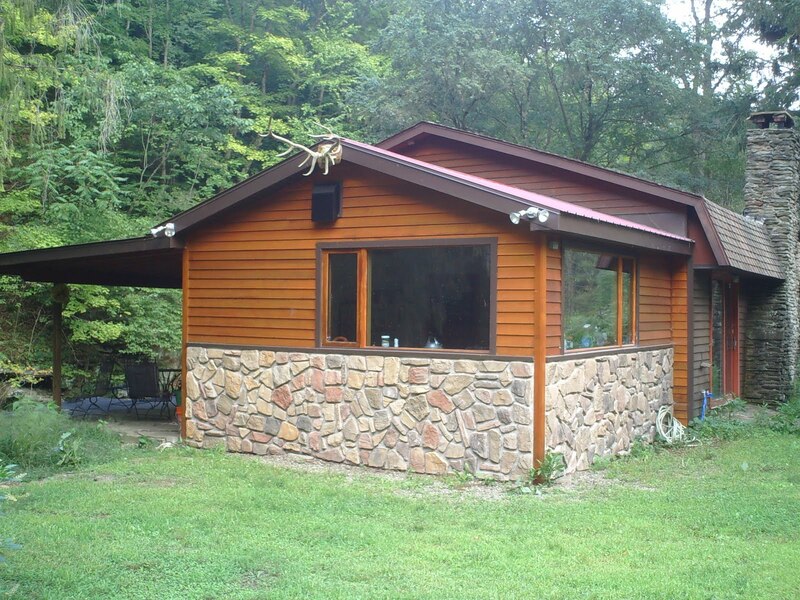 For anyone who dreams of building a log cabin, I am betting none of your dreams have rain and mud in them. Left my house about 2:30PM Friday afternoon. Stopped in Allenwood for gas arrived at Lee Pines Camp at about 6:30. Had trouble with cook stove finding the damper. 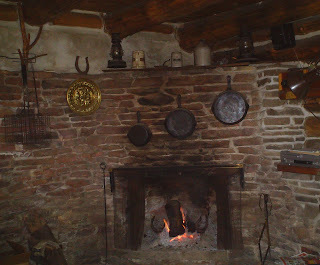 So the cabin got filled with smoke after 1 ½ hours the smoke cleared and Ron started his world famous chile. The cooking takes very little time (Ha Ha) only 3 hours. After eating Kenny went to bed Ron and Bob took all of B.J. 's money. Butch, Ken, Dennis, Ron, Bj, Paul, Paul Jr. Dave, and Arlow. All stayed at Lee Pines while working that weekend. I am leaving words and grammar alone as much as possible to maintain the authenticity of this log. The roads finally thawed enough to allow entry to camp. No one has been there since Dennis and Linda were up Christmas Day. Although, someone made it in far enough to steal our lawnmower. We talked with Don Harris in Marshlands about the logs for camp: Cost $325 per truck load. We then went to see Bravo Buttons to get a building permit. He lives about 3 miles from Don. The permit cost $7.50. It was $5.00 for first thousand and .50 for each additional thousand and we valued construction at $6000. We then went to see Jack House of Morris who owns a sawmill. He already had the lumber cut that Daddy ordered. We couldn’t have gotten a nicer lumber for twice the money and he was cheaper than any mill I’ve seen down home. He also helped us by letting us get rid of the junk and debris from camp. Left house at 7:00 am on Sat. 16th of March to clean up ruble from burned camp. Ron and B.J. went in Ron’s Jeep. Bob and myself went in 67 Chev Truck. Stopped to eat in Jersey Shore; arrived at Camp about noon. What a mess loaded the large junk in the truck, Bob and I took the junk to Jack House’s sawmill. Paid Jack for lumber and unloaded the junk. We brought some lumber alone back to camp. And the fun is just beginning. Mountain girl, Paula, logging out. The picture is not Cedar Crest is a stock picture of burnt cabin. In the late 1980's- 1990, Leetonia was plagued by a series of theft and arson. This is the story of one camp's journey in their own words back from the ashes. On December 23, 1990 the crazies, who were on the loose for several weeks in Leetonia pillaging the camp, climaxed by burning Cedar Crest and six other camps in the area. Although they destroyed thousands of dollars worth of property, they accomplished little for there was more to Cedar Crest than the building where we slept. The spirit of the camp can not be destroyed by fire, or flood, or the crazies themselves, so long as we have our memories. Some day I will be telling my grand children how my grandpa died on Fahneystock Mt. and how my father took me fishing at Rattlesnake Rock, and Joe Benardo’s son Tony will be telling his kids how he shot his first buck in the dam hollow across from camp. But now is the time for change, and like the legendary Pheonix, Cedar Crest shall rise from the ashes. No Cedar Crest has not been destroyed it’s just gone through some major changes and this is the story of those changes and the memories not yet made. I will continue to post this journey each day as recorded by Cedar Crest members. I remember the fear these few drug crazy people introduced into our town and am glad its time is past. Hope you enjoy this as much as I do. Mountain girl, Paula, logging out. First I want to say Happy 54th anniversary to John and JoAnn Grube of the Bear Mountain Camp. They kindly shared their anniversary with me and feed me a delicious meal: roast beef, green beans, noodles, gravy and pickled beets with eggs. I will have to say the only thing better than the food was the company and conversation. The evening reminded me so much of how my grandparents would entertain others at their home. I fear this kind of conversation and fun may be a lost art with the advent of computers, cell phones and texting. We talked about animals, hunting and weather. The three big topics here. Most might think this is boring, but I never tire of hearing people's stories. John shared one about seeing a hawk attack a turkey while he spotted for deer through binoculars. John said the turkey got a terrible blow at the base of his neck, but turned to defend himself against the hawk and succeeded in scaring the hawk off. John watched the turkey go to roost that night badly injured. Then he saw it come off the roost in the morning to once again walk through the woods. He asked if I had seen many bears and on the way home one ran across the road in front of me as if to say off course she sees bears. The travel to work this morning was blocked in two spots as I headed to Blackwell. The first being just after I turned on 414 headed north over the bridge at Cedar Run. They were fixing some axel breaking holes on the road and I waited. 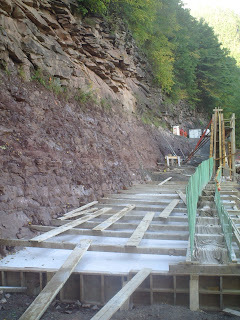 The next is the work they started on the narrows a month ago. They diverted people down the bike trail(15mph). They are pouring concrete to shore up the side as you can see in second picture. 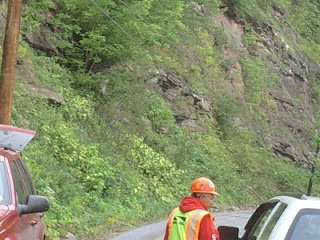 As I got closer a backhoe worked a hundred feet above me(3rd picture) and they blocked the road as rocks fell to the bike trail. The flagperson said she had seen rocks fly all the way into the creek. In the last picture you can see how steep and rocky the cliff is behind the flagger were rocks dropped as I waited. 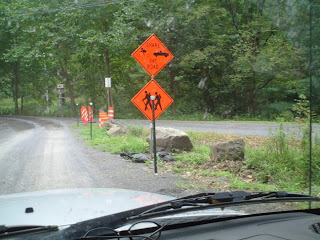 The road is limited to 7' wide which excludes my construction trailer. This makes it difficult to get materials to the Blackwell area as going around adds about 50 miles and another hour. 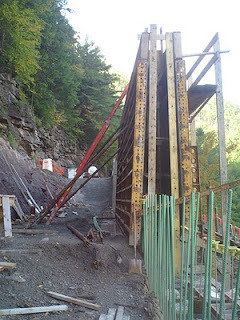 But it will all be worth it to see the narrows fixed. They don't expect to be done any before November. Thanks again to the Grubes for a great night, great food and great company. Mountain girl, Paula, logging off. 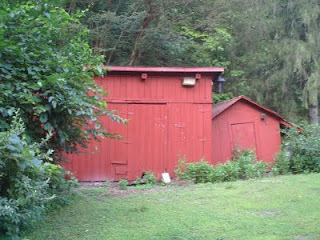 Last night I went to bed wondering how much wind and rain we would get from Hurricane Irene. As I went to sleep in the silence of the forest I could hear the sound of Giants footsteps through the woods. Was the storm coming so soon? I strained to listen... Sure enough the rhythmic beat of large feet coming through the woods could be heard. My heart beat just a little faster. I could imagine the wind tearing trees down like on the memorial day storms. I could imagine water tearing through the dam and bridges like during hurricane Agnes in the 70's. I tried to silence my own breathe to listen closer and realized my giant slept at the foot of my bed, LEO! Breathing slow low breaths that sounded like footsteps. Mystery solved I went to bed to see what morning would bring. As the sun rose or should I say it got a bit lighter...it was raining. 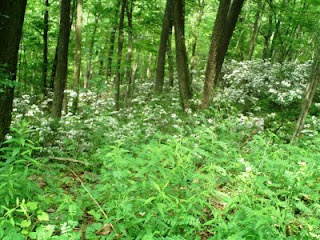 It rained on and off most of the morning and the wind gusted at times but never enough to drop the forest to its knees. By late afternoon the clouds disappeared and the air went cool like autumn is supposed to be. I took this picture of the apple tree in our front yard around 6pm. Although, it is difficult to see, there are many small apples on the tree. In fact, there is an abundance of apples this year, which should make the bears and deer quite happy soon. The male hummingbirds have all left, but due to an abundance of babies this year I am still feeding quite a few of them. I did take down 3 quart feeders so now there are only 13 up. By the end of tomorrow I should know if I can take anymore down. They won't completely be gone until the end of September. Lee always keeps a few up for travelers coming through on their migration south. Lee is still with my mom. This is the beginning of week four alone in the woods. I will have to say I will be happy when she is home so I can have someone to talk to besides the dogs. Mom's surgery went well and we will know by Thursday how soon Lee can leave. I think she is anxious to be home too. There is no place like Leetonia. Mountain girl, Paula, logging off. Rain has eluded us for the most part, but when it does start a storm the hummingbirds go crazy. The above video is just one on the 16 feeders surrounded by anxious hummingbirds. I haven't noticed much of a drop in the amount of food they are eating. I keep expecting the males to start leaving and the amount of food to drop. The roads have been dusty and it is still hot working if you aren't in the shade. 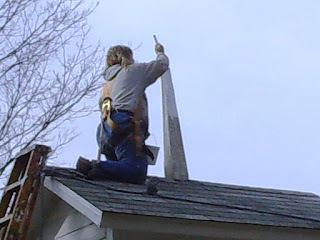 I did the corner of a storm damaged roof for Tom Finkbinder and it was not the week to be up on a roof. His house is in the direct sun. It got to 89 degrees and the roof was hot enough to burn your skin if you knelled on it or touched it with bare skin. I keep hoping for rain, since when it rains I get a day off. So far not many days off in August. The creeks are bone dry. I happened to meet some bicyclists coming up Leetonia road and they asked me where the falls was. I had to tell them it was dried up. For some reason they thought all the snow we had would have stuck around long enough to make the falls nice for them in August...go figure. I can hear the sound of thunder outside and it is starting to rain the plants will be very happy tonight. Mountain girl, Paula, logging out. 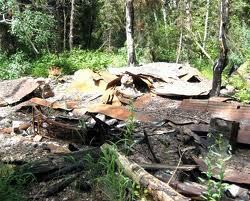 All good things come to an end and it seems the members of the Ruins Camp are all getting older and decided to sell. 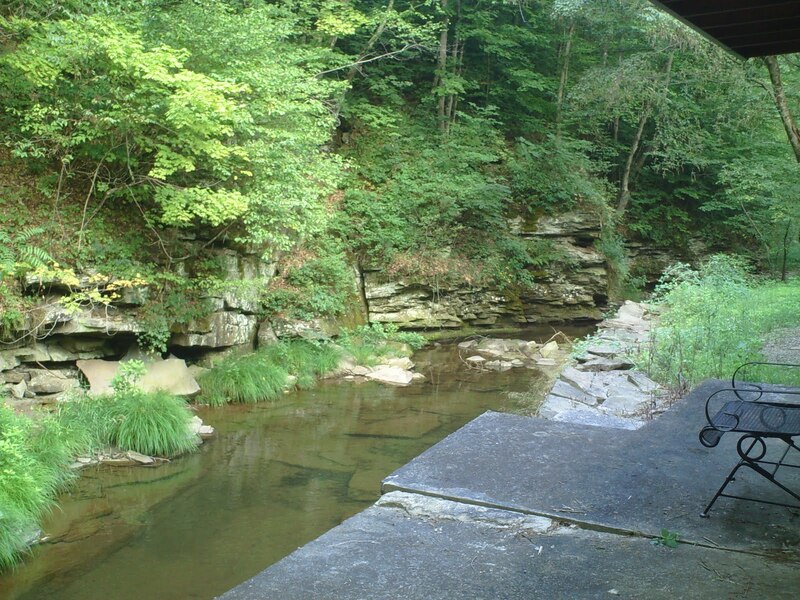 This camp has three acres and at least a couple hundred feet on it are right on Cedar Run Creek. They put a kitchen addition on a few years ago...which is very nice. The rest of the camp needs some work. 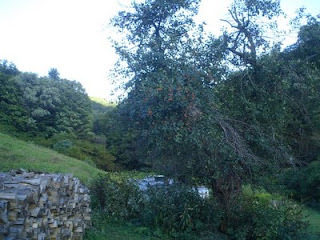 The water comes from a spring and I am not sure what the septic system is. The camp has 4 bedrooms, one of which holds to bunk bed units(one is 3 bunks high..the room is tall in bunk room). creek needs some foundation work. The creek view from the deck is unmatched. There is a solid rock bottom to creek that runs at least the length of the cabin and makes for great body sledding down the stream. You can always see trout swimming just outside the back door. For someone not afraid of a little work this place has a lot of potential. They have made me in charge of showing it to people and are taking offers. Contact me at campeaglebear@yahoo.com if you are interested. 40lbs I bought just a week ago. For such small birds they can sure eat a lot. 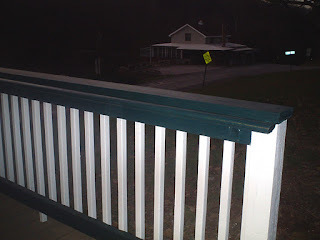 If you are in the area come sit on our porch in the evening or morning it is quite a treat. Mountain girl, Paula, logging out. The hummingbird babies have hatched and are feeding vigorously. Lee has 15 feeders around the house and while she is gone helping my mother I am in charge of keeping them full. The first day they went through 4 gallons of fluid. That is ten pounds of sugar to make the 4 gallons. Every feeder was emptied by the hungry birds. Looks like I will be running to the store for more sugar. The feeders were again half-empty this morning. We only have a couple weeks of heavy use by the birds then the males will start leaving around the end of the month. Even with fifteen feeders you can often see 8 to 10 birds around each feeder in the evening. We truly live in a humming bird hive. Mountain girl, Paula, logging out. 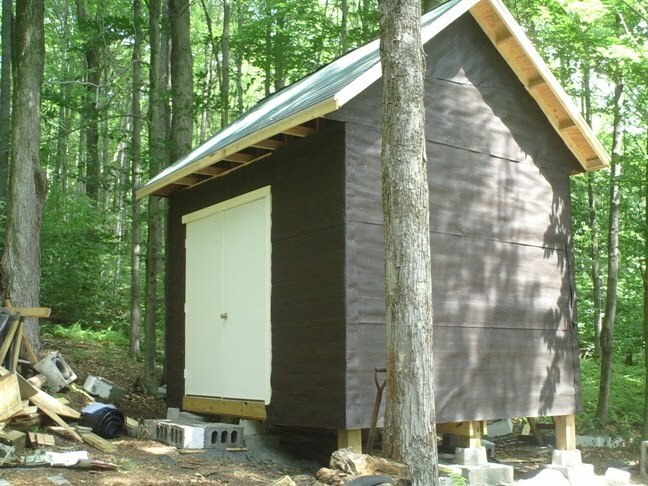 Last day of July today and I finished shingling a shed I am building at a leased camp in the middle of no where. Without electricity building takes a bit longer. 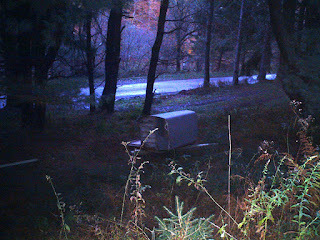 You have to use a generator and the sound of the generator running pretty much ruins the solitude. Today however, the shingles just needed a utility knife, hammer and nails. The building is going to be vinyl sided and the soffits covered with aluminum. Scooter goes with me most times to work when the weather isn't too hot for him. He loves watching for intruders and making sure I don't work too long past his dinner time. We are down to three dogs now. I returned Thor our three-legger to the girl who gave him to me. It had become too much to feed and care for all three large ones. She has his sister so after his sister told him she is in charge they got along great. Funny how you can have so many and still miss one when he is gone. I keep expecting to see him laying in his favorite spot on the front porch. Lee is going to spend some time with my mother in Iowa to help her out. Her husband passed last week after a short intense battle with cancer. Now that she is older it is harder for her to cope with the loss. 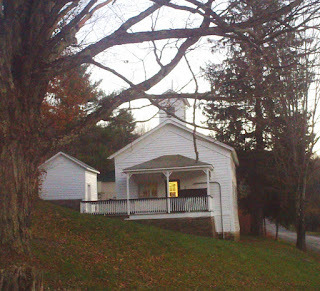 2011 has been a year of dealing with many family issues, which still find you even living in the middle of the woods of Leetonia. Mountain girl, Paula, logging out. When it gets in the 90's back here it is hot. Fortunately, this doesn't happen too much, but when it does it is hard on animal and human alike. 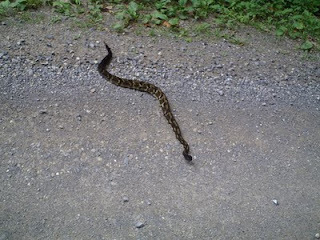 The rattlesnakes have been on the move in hot weather seeking the cool of the creeks. I saw this black Timber Rattler today in front of Red Rock Camp. 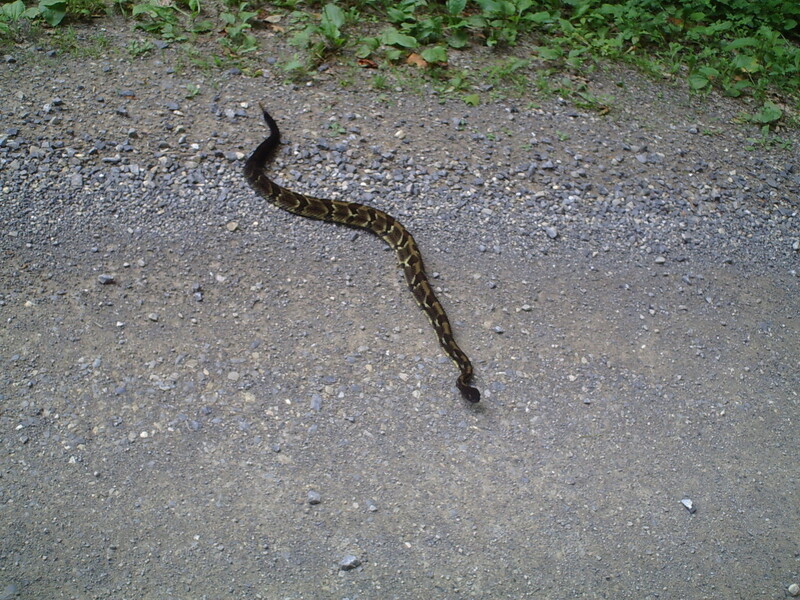 I saw a larger yellow one crossing Francis Leetonia road yesterday. If you don't know what they look like you might think the black ones are sticks on the road until you look a bit closer. Caution should be used swimming in the creeks to make sure you look out for your fellow snakes looking to cool themselves as well. Timber Rattlers aren't real aggressive but they will bite if you get too close or step on them. You are safe if you stay the length of the snake away and don't bother them. Most of the snake bites are people trying to pick them up or mess with them. Cool weather isn't in sight so keep hydrated or best yet sit in a cold stream. Mountain girl, Paula, logging out. The last month has made up for all the rain we had early this Spring. The creek is now low and everything is turning brown. Hot and humid in the woods so much so you feel like you are in a terrarium. The Eagle at Cedar Run had a baby who is flying and complaining a lot lately. I think the parents are teaching him to fish. He sat in a tree today just at the end of Cedar Run hoping for something to eat. I was working close to there and heard his cries going unanswered by his parents. Growing up is tough even for eagles. 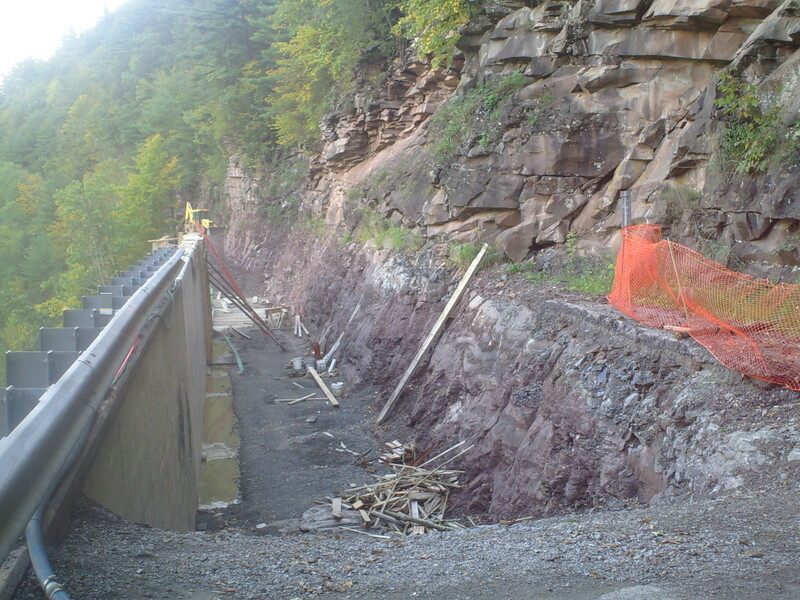 The road going through the narrows will be closed probably by tomorrow and traffic diverted onto the bike path. The have limited the width down to 7', which makes it impossible to haul my utility trailer through there. Don't know how long this will take, but I am guessing we will be lucky if it is finished before winter. 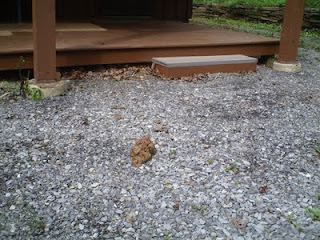 Well anyone who read the last blog noticed I was working on staining a log cabin when I discovered rotten logs. It ended up the whole bottom log was rotten for about seven feet including the bottom plate. The log was eight inch high red pine and since I was unable to find any kiln dry pine that large, I cut one on my property to match. You can see I then split the log in half as I built the back of the log up with treated lumber to the half way point. 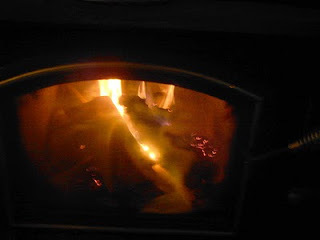 The first log isn't visible from the inside of house since it is under the floor or I would have needed to put in an entire log or log side both sides. 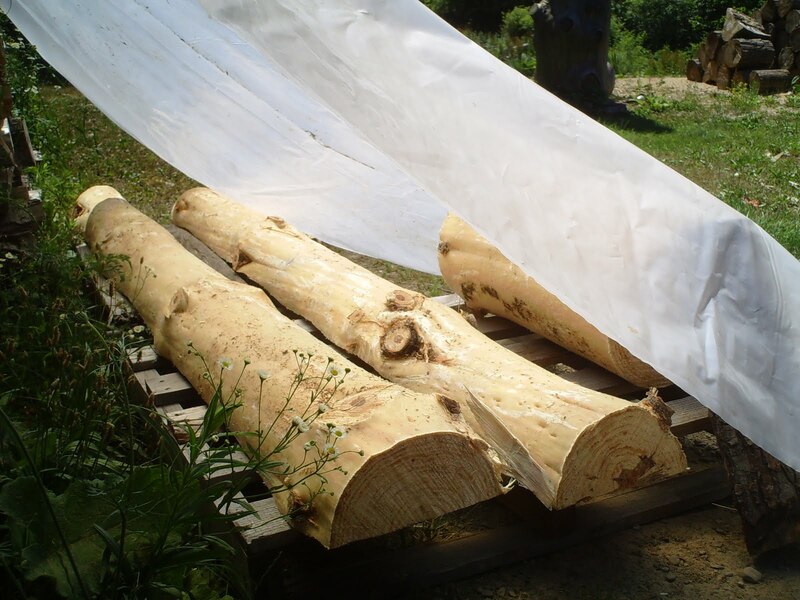 Since these logs are very green I am trying to fast dry them on the south side of my house under a plastic sheet. I figure in 2-4 weeks I can get quite a bit of the moisture out. 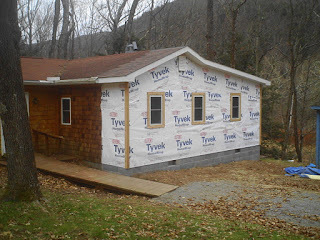 The rest of the drying will need to take place on the cabin after they are installed. I am hoping for them to be dry enough to take on some preservative. Of course the preservative will need to be put on again toward the end of next summer when they are drier. Once I get them in place I will post them again. Mountain girl, Paula, logging out. Good news for this baby robin. I was working to power wash a log cabin for painting and there was a robin nest with 3 eggs in the way. I decided to see if I could move it to a bush a few feet away. I wasn't sure mother would find it. But she did and hatched at least one of the three eggs. The baby is hungry all the time and hopefully it will survive and fly. beetles. You can see the holes about the size of pencil lead in the logs especially in one corner. Unfortunately, this has gone on too long. Previous owners stacked firewood and other wood under and near the cabin. The wood rotted and brought the pests. The have eaten through about 10 feet of this bottom log and as you can see eaten the plate board it was sitting on. The log will have to be replaced along with the plate. Wood cabins must be stained every five years now with the changes in safer paint(shorter lasting paint). 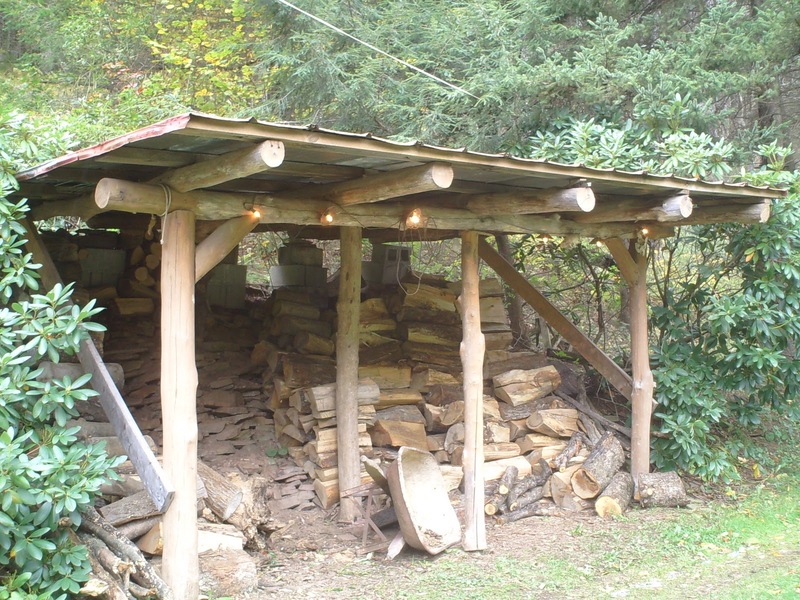 If you want the beauty of logs consider the work of maintaining them and never stack firewood near any wood camp during summer months when bugs are active. It will be a lot of work to fix the damage on this place. Mountain girl, Paula, logging out. 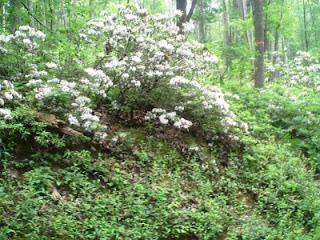 Mountain Laurel blankets the sides of Cedar Mountain with hues of white and pink flowers. If you have never seen the mountain covered in this flower this week is the time to see it. 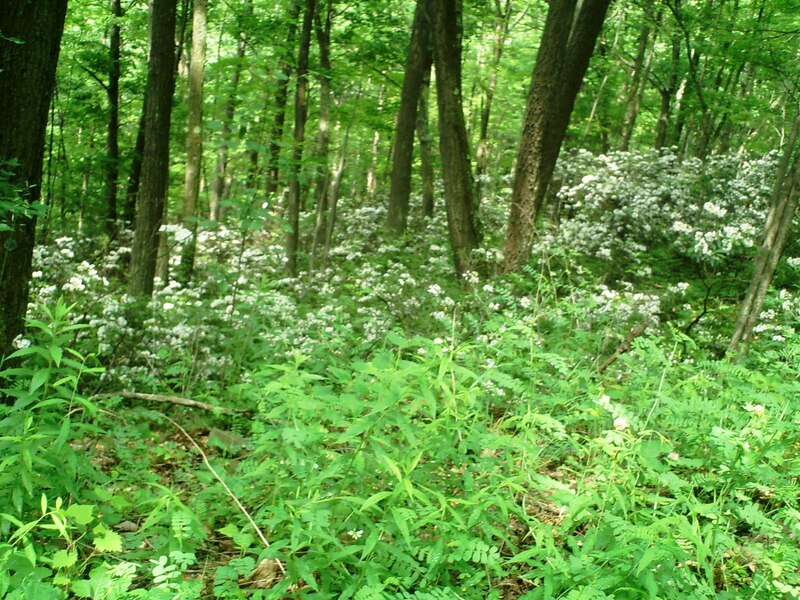 Soon the blossoms will fall and the forest will be green until fall color season. 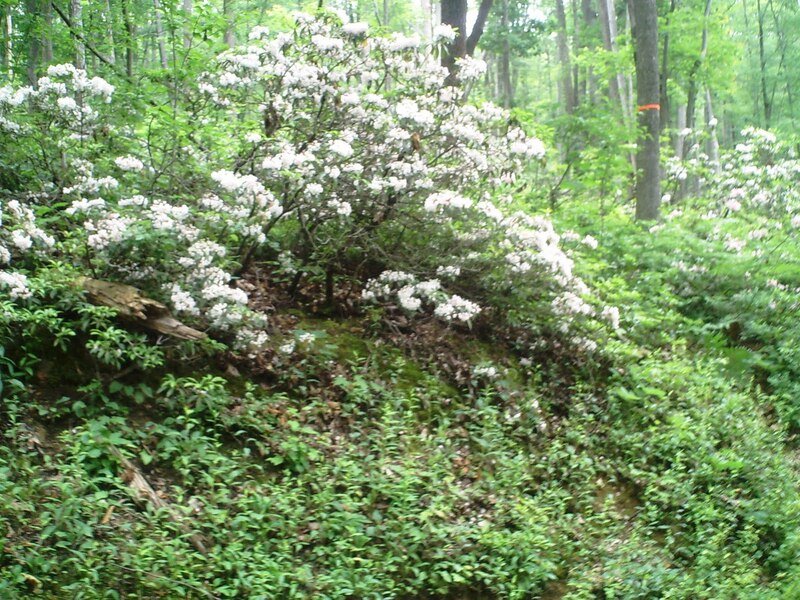 Last week was the Mountain Laurel festival in Wellsboro. I ended up working through the weekend and didn't get a chance to go. But I get to see the flower daily that give the festival its name. cross the road is never disappointing. During the weekdays I encounter few other cars. I saw Turkey, deer, grouse, and one very large bear. 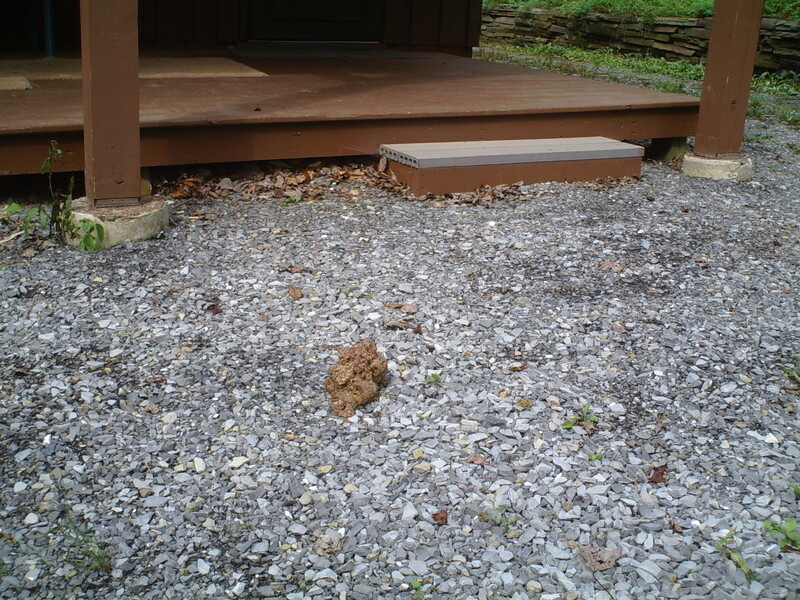 Seems to be quite a few bear in Leetonia looking for a free handout from camp owners. 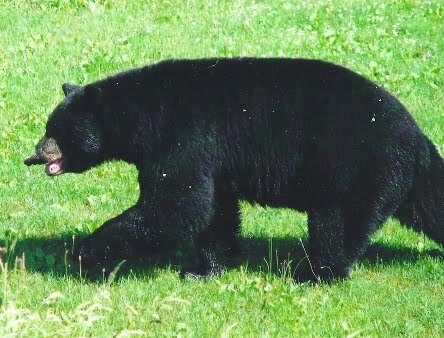 I had to stop feeding the birds years ago when the number of bear in my yard day or night became a problem for my dogs. I never opened the door without looking first to make sure one of the bruins wasn't walking outside. They can be hard to see in the dark and they are amazingly quiet for such large animals. 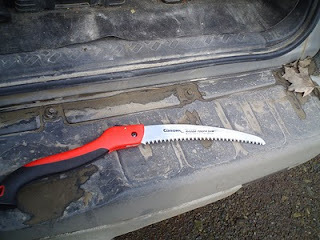 Fencing an area for the dogs to go at night is keeping my dog/bear emergencies to a minimum. Living with nature is a joy but also an adaptation to how you think about daily activities. Weather plays a big role all year. Any plans you make can be quickly changed by rain, wind, ice or snow. Respect for what the weather can do is essential to living as accident free as possible. Watching the sides of the road for the sudden deer or bear appearance keeps your vehicle dent free. 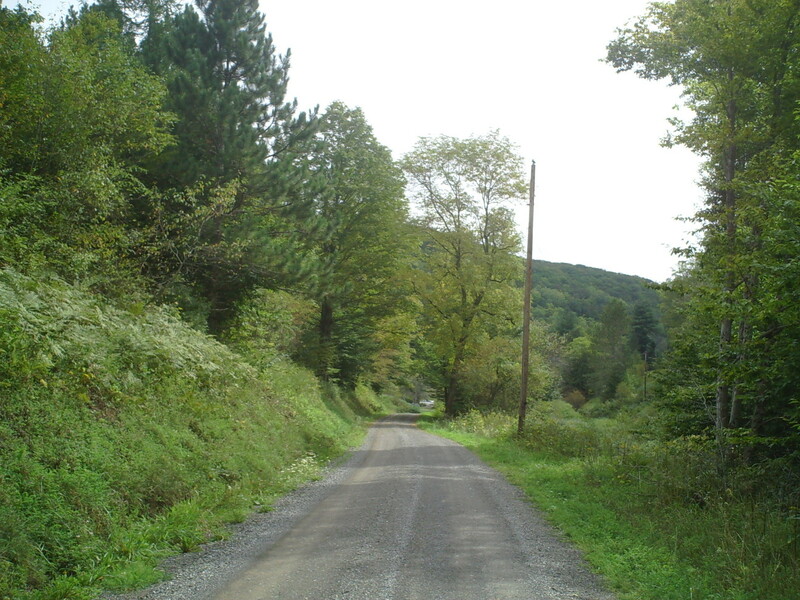 Surviving the gravel roads effect on your car or truck is unavoidable. Tires, suspension, paint last half as long. Three ply tires last just about as long as it takes you to change them. I changed the first one on my Cruiser I picked up a month ago. A stone the size and shape of my index finger pierced the tire beyond a plug fix. I expect by the end of summer to have four upgraded tires as they all gradually are destroyed by the roads. Knowing how to change a tire is a basic necessity as well as having a good spare. 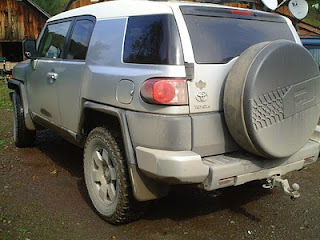 In an average summer I fix about four tires between the two vehicles. Getting help could take you most the day. But I have noticed the vehicles I am getting keep having bigger and bigger tires. Lifting these on and off the vehicle is less and less fun. Course I could live somewhere with instant cell coverage and help....no it is worth the trade. 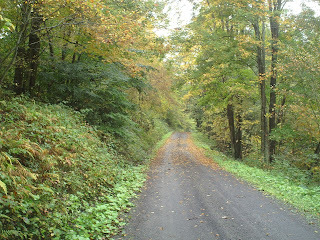 I still love it in the mountains of Leetonia and I know I always will. Mountain girl, Paula, logging out.